catkismet | The destiny of hearts. My brother-in-law called to say he was going to burn his brush pile and invited us over for the big event. I left the decision up to my son since he had homework to do…. Let’s Go, he said. We can see Domino! My brother-in-law knows how to build and feed a fire so it would be fun AND we would get to spend time with my Darling Domino. When we arrived, Chris was ready to go and Domino was taking a dirt bath. The men (my brother-in-law, his son and my son) were ready with the hose and ignited some paper. It started right away – Domino ran and took refuge behind a board that shelters the cut fire wood and only his head could be seen. He is just so darn cute. The fire was exceptional and didn’t produce too much smoke (no black smoke) and what smoke there was blew away from us so we were very pleased. As it burned down, they added more debris and monitored the perimeter with water. It was very exciting. Domino came and went but stopped by for kisses every pass through. After almost 3 hours, we decided to head home so I called him to say good-bye. Apparently he wasn’t very close (or was ignoring me) so my nephew got the bell he has trained Domino with and within just a couple of minutes Domino could be seen racing back towards the house from quite a distance. He of course didn’t want to miss the opportunity for some kibble…..I had a bowl for him but insisted on holding him and kissing him before he got it – then Wille wanted to do the same. He was extremely tolerant of this and his purrs could be heard from 8 feet away. I so love this cat and am amazed at how he still comes for dinner – now it is just with a bell rather than a call from across the street. He has to be the happiest cat on the planet – his dreams have finally come true. Are the prophecies being fulfilled? 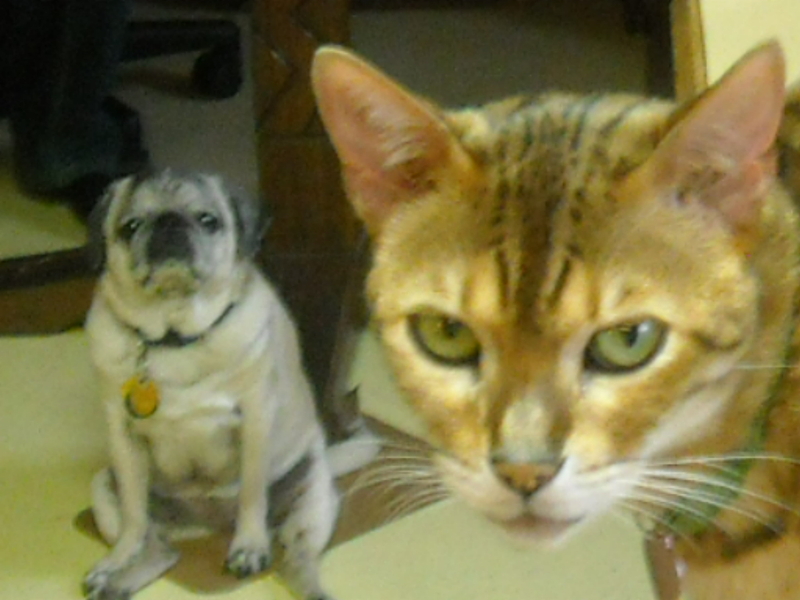 Are the dogs superseding the cats and destroying Cat Town? Since Domino, King of Cat Town, has been removed from his Kingdom for safe keeping, rumors are flying that his Kingdom is being taken over by the dogs. 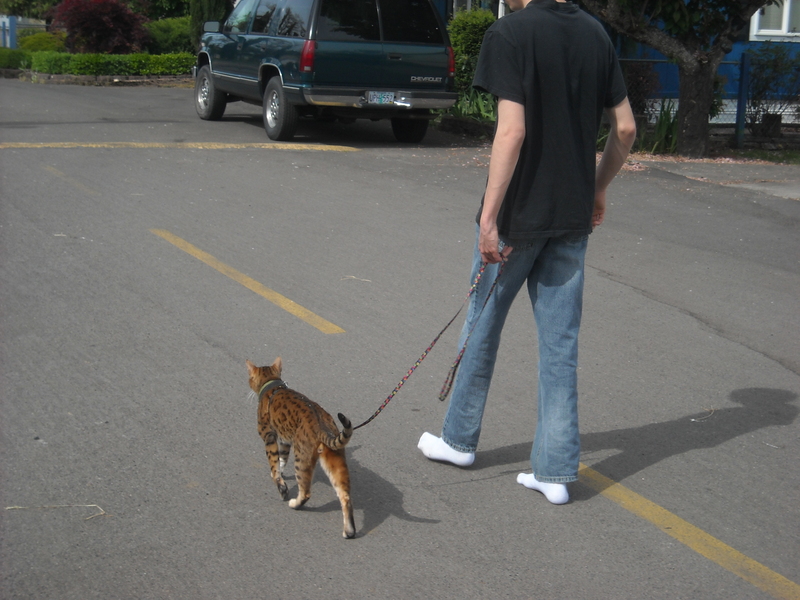 Cats have been seen walking on leashes with their owners. Are the cats disguising themselves as dogs in order to survive? At least five cats from the Kingdom have been reported dead – mauled by dogs – in the past 6 weeks. A chicken was recently killed and a cat was blamed. Could it have been forced to do this by a dog, or was it a dog and evidence directed at the cats? Sad times. Domino is devastated and holds himself to blame. His safety cannot be risked – he cannot be allowed to return to Cat Town. 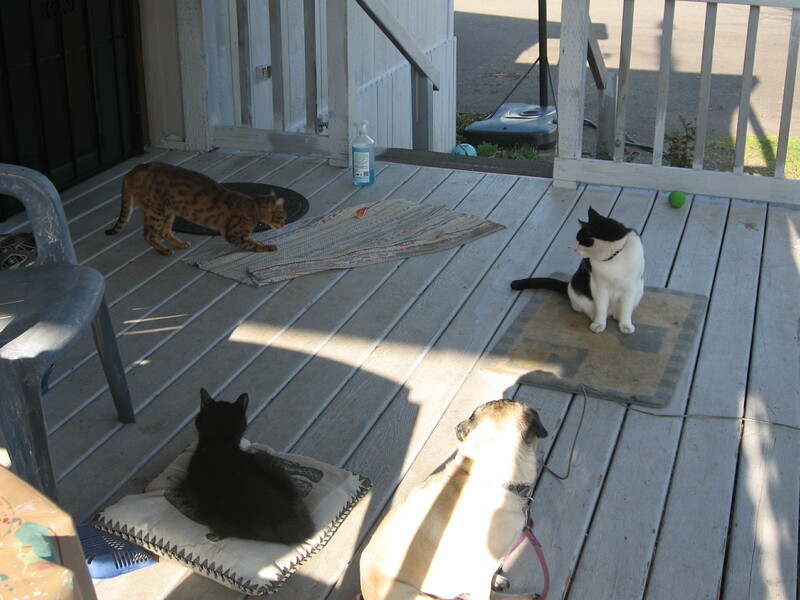 Several years ago it was prophesied that Dogs would attempt to ruin Cat Town and take over their domain. Certain events were detailed in Cat Town’s history recorded by Willamette Johnson. These are difficult times in Cat Town. No one was available, or willing, to comment. 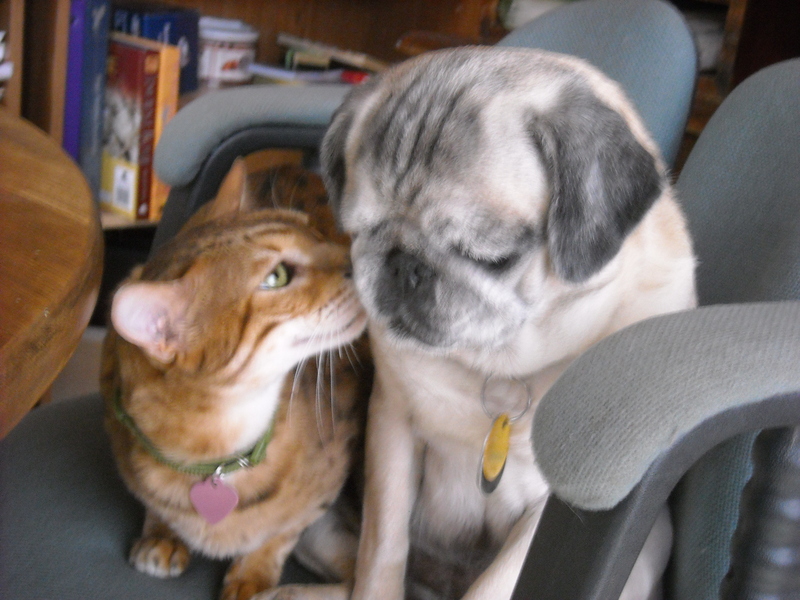 There was a time, however, when all Cats and Dogs were able to live in perfect harmony. They co-existed and were known to relax and hang out together. Will those days ever return to Cat Town? Stay informed ~ add your name to the list of followers to these posts. Domino is an amazing cat. Everyone says so. “I can’t believe that cat.” “He is awesome.” “Such a good cat.” These are just a few of the comments neighbors have offered with regard to Domino. When my son was younger, he wrote a story about Cat Town and he of course made Domino the King. Several years ago when we first got Domino, he was about 1.5 years old. He would go out everyday and make several trips around the neighborhood – sort of like he was doing sentry duty. 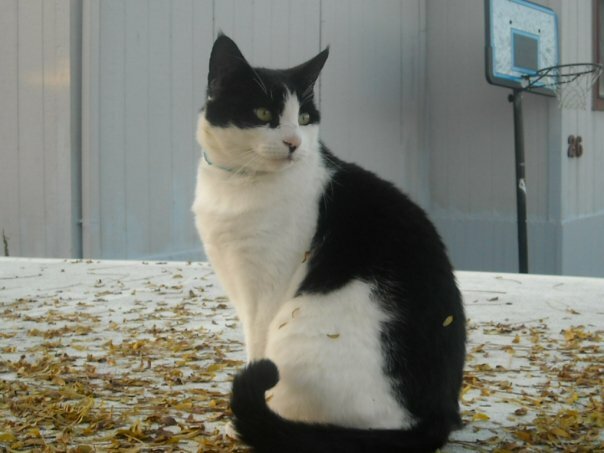 People would see me and say “I saw your cat today, he is really something.” I witnessed some of this on occasion – Domino would walk by someone’s house and they would holler out “Hi Domino” and he would turn his head toward them and nod. One kind old man who lives at the corner would see Domino every day as he sat on his porch. “That cat is the smartest cat I have ever seen.” Domino would walk along the sidewalk, hugging the side of the road and then disappear. Bob would see him pop up on the other side a short time after. Domino was going into the ditch and into the sewer pipe crossing under the road to avoid the traffic. We live in the country next to a very busy road and even though the speed is posted at 25 miles – everyone disregards it. Bob is still amazed several years later because he would see Domino show the other neighborhood cats how to do it. Have you ever owned a cat? Has a cat ever owned you? My cat Jackson totally owns me and my heart. Once you see him, you may understand why. It isn’t just because his looks are amazing, and it isn’t just because he is the sweetest boy ever….he simply knows my heart and keeps me in my heart. 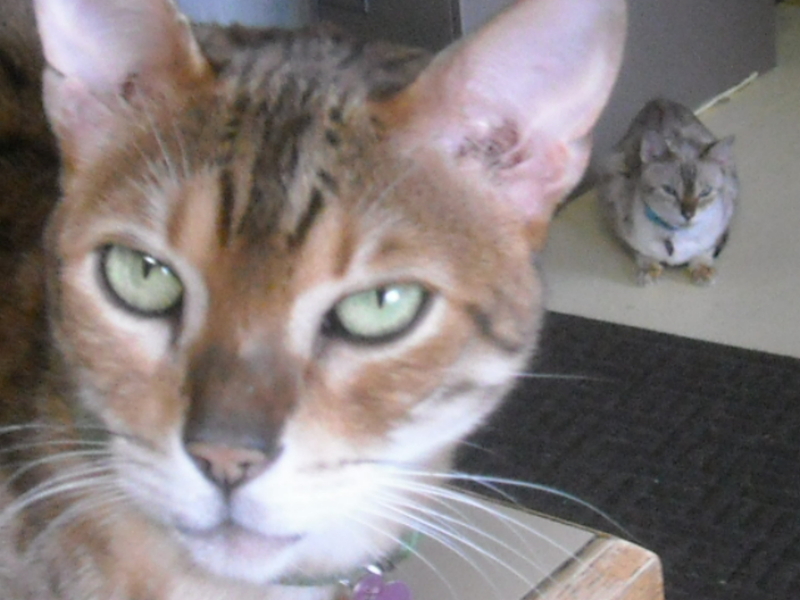 Jack and Juni are Bengal cats. He is an Asian Leopard and she is a Snow Bengal – a Snow Lynx I believe. They are not papered, I did not buy them – they simply came into my life in a time of need. They heard my heart and they responded. I love cats – totally. I love my dog, Georgia. She’s just about the cutest pug, even in her old age, you can imagine. But I am a cat person. I have another cat, my darling Domino. He is a black and white cat. Not a tuxedo, but a traditional black and white farm cat. 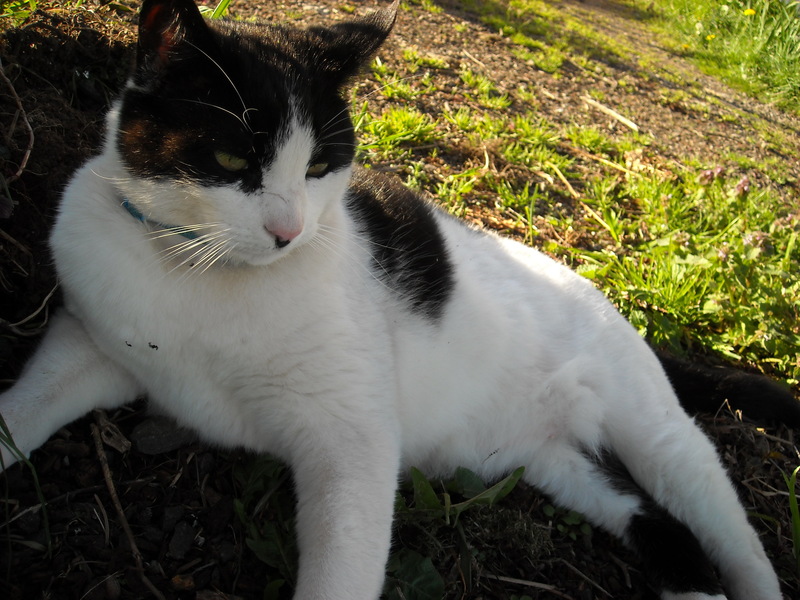 He has a pip below his nose which unfortunately makes him look rather Hitler like, but he is a kind and loving cat. He doesn’t live with us right now as I had to re-home him because of some bad neighbors (with guns). He likes to wander….He currently lives at my brother-in-law’s 5 acre farm where my dear nephew cares for him. He is totally happy and that makes me happy, but I miss him terribly and that makes me sad. We see him frequently, but I miss his snuggles and his meow. Bengals are awesome creatures. They are extremely devoted to their humans – they understand many words, but mostly they understand heartfelt emotions. They evoke emotions simply by their ability to look into your heart – into your soul. I’m having a bit of difficulty now because Jackson wants to go out all of the time. The weather is finally getting better and it has been a full year since he was able to be outside whenever he wanted. I’ve been taking him for a walk twice a day (yes on a leash…hoping to get a video of this soon so you can actually see this). They are allowed free romp first thing in the morning when I walk Georgia, but I’m always in a hurry so that can’t be much fun. He is getting better at returning promptly when Georgia is done and we head into the house for breakfast. His new breakfast food may be part of the reason. Here is Jackson with Junipearl…. Jackson wanted you to see how large he is compared to his sister. Junipearl needs a picture of her own to show you just how special she is. 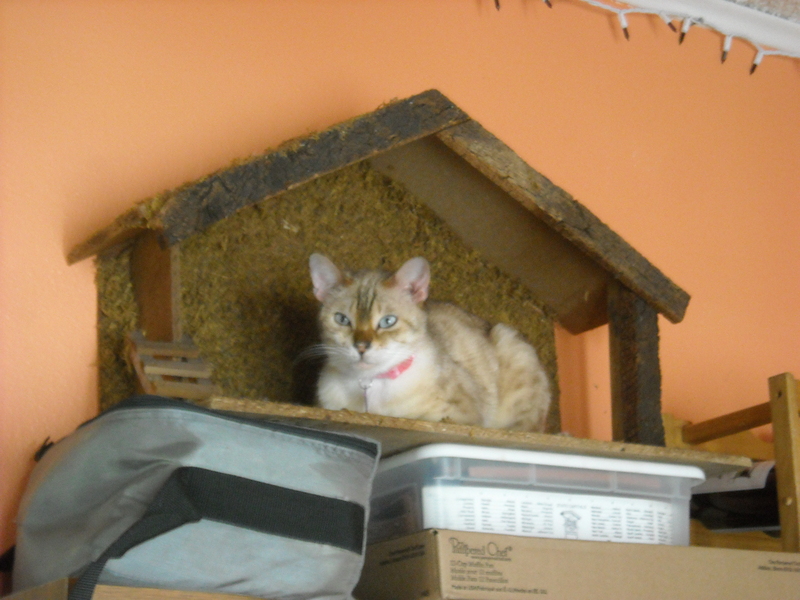 Yes that is a Manger – it shows you just how special she believes she is. I’m still searching for the perfect picture of Domino. This is all new to me and although it seems to be working fine, I need to be more organized. I think Jackson likes all the attention – me writing about him and showing his picture but right now he would prefer that I provide that attention with a walk instead. Guess I’ll close for now…he’s waiting at the door.